Russian gas monopoly Gazprom announced it could increase the amount of natural gas it would send to its European consumers through the transit system in Belarus this year. Ukraine currently hosts the bulk of Russia's natural gas bound for Europe, though Kiev is locked in a tug-of-war between Brussels and the Kremlin. Gazprom's move, therefore, says less about the monopolistic tendencies of the Russian natural gas company than it does about the status of Moscow's relationship with neighboring Ukraine and the broader European Union. Gazprom said it could increase the amount of gas it sends to Europe through Belarus by 13 percent compared with 2011 levels. Ukraine currently hosts about 80 percent of the Russian natural gas bound for Europe, though Kiev had threatened to cut the amount of natural gas it buys this year. The Ukrainian government complains that, at around $400 per 1,000 cubic meters, its paying far too much for natural gas. Minsk, for its part, only pays around $160 per 1,000 cubic meters, but it got that deal by selling its gas company Beltransgaz to the Russian energy company for around $2.5 billion last year. Lukashenko last year threw hundreds of his political opponents in jail following December 2010 elections. European foreign ministers responded with economic sanctions targeting an economy so bad that Lukashenko once threatened to close the borders in the event of an economic calamity. When Kiev threw opposition leader Yulia Tymoshenko in jail on corruption charges, however, Europe, despite some complaining, eventually invited the country's president to Brussels to talk about free trade agreements. In 2011, the Kremlin said its war with Georgia in 2008 prevented NATO from encroaching on its turf. Before that statement late last year, Minsk took delivery of two Russian-made missile shield systems amid escalating tensions over European missile defense. The Kremlin eventually took its toys and went home, however, and said it would probably boycott the upcoming NATO summit in Chicago over the mess. Europe following Kiev's latest gas crisis with Gazprom in 2009 started looking for new natural gas suppliers and transit routes. Gazprom, in a statement, said its discussions with Belarus concerned an increase in gas transmission to Europe "in the medium term." 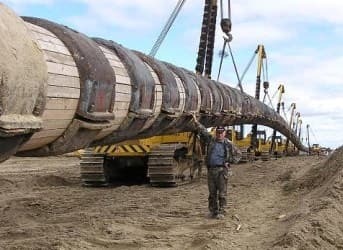 If Europe is somehow winning the political turf war over Kiev and Russia is putting the pedal to the metal with plans for pipelines around.